There are lots of reasons to celebrate – birthdays, weddings, new job, new baby, sporting victories. The list goes on. Just last week, we were finally ready to celebrate our amazing new Body Harmonics Pilates & Movement Studio and Health Clinic (Eglinton location) by showing our loyal clients how much we appreciate them and their continued support. Our new home warming was such a hit I thought I’d share some of the highlights. Earlier in the year, we were officially “bumped” out of our old Eglinton space by the landlord. We searched high and low for a location close to our previous address that would offer the same and even better service to our amazing clients. We found a great new space and worked tirelessly to have it ready by October 1, our scheduled move day. With any change, it can take a while to get used to a new way of being. We took a month to settle in before hosting our all-day home warming celebration. That gave us time ensure the studio and clinic spaces were fully set up, any initial issues were resolved and finishing touches were completed. Today our new place feels like home and has a fantastic vibe. The rooms have more space, there are fewer wait-lists for classes and more availability for private sessions. Not to mention the change rooms – we finally have some and they’re huge! Four of our clinicians offered to share their skills with clients. Rolfing, Registered Massage Therapy, Fascial Stretch and Chinese medicine-based tongue analyses demo sessions were available for clients to sample. Many clients had never tried the therapies before and were impressed at how they felt in their bodies after just 15 minutes of body work. 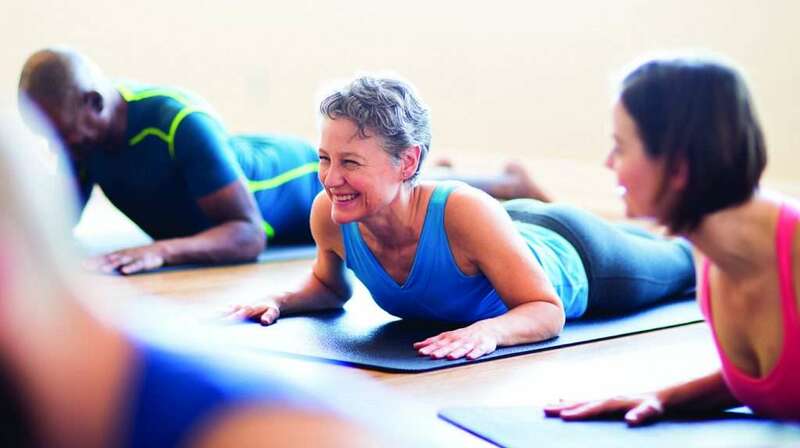 Naturally, many clients who attend a Pilates studio have done Pilates, but not everyone has had a chance to work one-on-one with an instructor and use some of the specialty equipment available such as the Pilates chair, ladder barrel and MOTR. Offering an opportunity for clients to try out the equipment in our new private room gave them a chance to experience it first-hand. It’s always a treat to learn from and move with Margot. She’s brilliant and always has a way of giving your body exactly what it needs. And her free home warming Master Class was no exception. So what did participants have to say? Everyone who came to our new studio home warming got to enter to win a $150 Body Harmonics gift certificate. Big congrats to Sandi Wall who won the prize draw! As an extra special thank you (and opportunity to do some holiday shopping), we offered 20% off EVERYTHING in our store. We also had select items for up to 40% off. As usual, ToeSox and Body Harmonics apparel were the biggest hit! Each client got to walk away with a “You’re only as strong as your spine is flexible” latte mug in a take-home gift bag. Many said it was a really nice touch and a perfect gift to remember why Pilates and movement is so important to our weekly routine! No celebration is complete without good munchies. We had some veggie trays, shortbread cookies, Superfood Truffles Recipe and the most amazing Miso Caramel Popcorn. Elaina Morin offered recipes for her delicious treats and many of our guests planned to make them over the holidays. The studio was spruced up with colorful balloon bouquets, festive flags, table cloths and fun music to top it off. We will stay in our new Eglinton home for the next four years. The building is being repurposed for condominiums, so our search for a permanent home has already begun. We plan to stay in the area and will definitely keep you posted on the project. Until then, please continue to enjoy our new space as much as we do! And if you don’t live in the Toronto area, please pop in for a visit next time you’re in town.